The Society of Friends, or Quakers, had met in Henry Lavor’s house in Yeovil in 1654, and had established a burial ground in Preston Road in 1669. 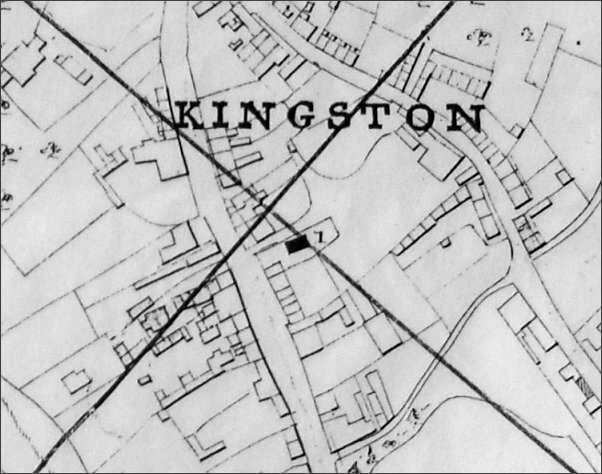 In 1688 a house and garden in Kingston, shown on the map below, was purchased for use as a meeting house, on a site now occupied by Yeovil District Hospital. "Up to half a century ago it is recorded that the Quakers met for worship regularly locally. The first chapel is dated from 1690 and was built in Kingston. Evidently meetings were held previous to this date, probably in some Quaker's house before the erection of the meeting-house, as a stone in the wall of the Friends Burial Ground in Preston Road, records the fact that in 1669 provision was made for the burial of members of their sect. (In fact Quaker meetings were first held in Yeovil in 1654, fifteen years earlier than the date on the wall of the burial ground). Half a century ago, as I remember it, the chapel was situated in Kingston opposite York Place, on a site now forming a drive and lawn to Mrs Moore's house in Higher Kingston. Judging by its style and condition at that time, one is led to form the opinion that it was the original building erected in 1690. It was a small, square building of rough Ham stone, with a thatched roof. The exterior was partially covered with ivy and jasmine, presenting the appearance of an old-fashioned country cottage. The windows, two in number, were in the frontage of the building, set a little lower than the roof. This interesting feature of their position suggests that it was for the purpose of preventing curiously minded persons from witnessing their simple devotions. The interior of the building was plain and bare of any artistic decoration. The walls were whitewashed, the pews high-backed and cushionless. Writing from memory, fifty persons would have severely taxed the seating accommodation provided for the congregation. The building stood about fifteen yards from the public pathway, enclosed by iron gates similar to those in existence at the present time. The present writer vividly remembers his first and only attendance at one of the services. My aunt was at this time the caretaker and cleaner of the chapel, my cousin and I used to relieve her of the Sunday morning dusting of the pews. One Sunday morning curiosity prompted me as a youngster, to witness the conduct of the service. The congregation consisted of about eight persons. After a long silence the Spirit moved a sailor who was present to engage in prayer. After this long lapse of time, I can still visualise the 'quarter-deck' shouting and 'sawing the air'. His vehemence of speech created a state of fright to my young mind. At the rear of the chapel was a paint shop and stores used by Mr C Foot who, I believe, still lives in Kingston. The caretaker's lodge, a low thatched cottage, stood inside the gates, on the right-hand side of the path leading to the meeting-house. Adjoining this were several small cottages facing the old White Lion Inn. These also had thatched roofs. The small front gardens were enclosed within wooden railings. At present, four brick houses occupy the original site of the cottages. If my memory serves me correctly, the chapel and cottages were pulled down in 1879. I have also a recollection of seeing the last burial take place in the Friends Burial Ground. I believe it was Mr W (sic - see note below) Hannam, a leader of the Quakers in those days, who found his last resting place there in or about the year 1879. He was a partner of a Mr Gillett, carrying on the ironmongery business in High Street, now in the occupation of Messrs Hill & Sawtell." Note: In fact Josiah Hannam retired and moved to back to his birthplace, Gillingham, where he had business interests and where he died in the winter of 1874, aged 77. He was buried in Gillingham. The photograph above, taken around 1965, looks south down Kingston towards Princes Street and is taken from just about outside the Duke of York. Just behind the car at right is the White Lion with its sign visible above the car and at the end of the street the Red Lion stands in front of the last tree. At extreme right is Sylvia Perrett's antique shop (on the corner of York Place). The three-storey building to the left of the tree left of centre is the former Yeovil County School. 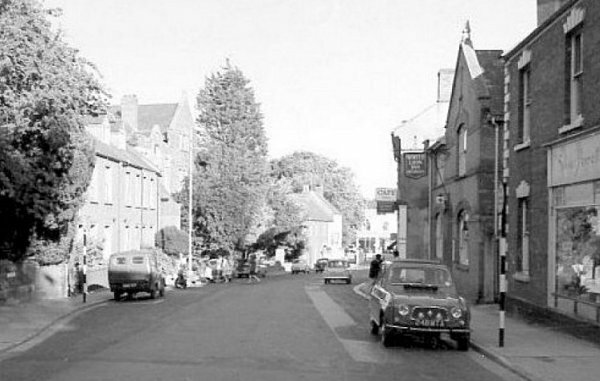 The row of four houses, at left and behind the parked van, mark the site of the Quaker Meeting House, the caretaker's cottage and the row of small thatched cottages that were all pulled down in or around 1879.